• In 1919, either Harvard or Illinois won the title, depending on who you talked to. But the National Championship Foundation, which was formed in 1980, polled its voters to choose retroactive championships for every year dating back to 1869. For 1919, they declared a three-way tie between Harvard, Notre Dame, and Texas A&M. The Billingsley Report, the creation of programmer Richard Billingsley, also retroactively declared champions beginning in 1996, including the undefeated 1919 Aggies. It is purely mathematical, arguably quite flawed, and has become an actual component of the BCS Standings. • In 1927, Illinois was the closest thing to a consensus champion those confusing 1920s could offer. But the Sagarin Ratings, the computer formula devised in the 1980s by Jeff Sagarin and more familiarly used for basketball, declared the Aggies the national champs that year. The conference titles are easier to sort out. • In 1997, the Aggies finished first in the Big 12 South—though with the third best record in the entire conference. In the conference title game, they were blown out by Nebraska. They're still claiming that year as a conference championship. • In 2010, there was a three-way tie in the Big 12 South, with Texas A&M coming in third by the tiebreaker of overall record. (There was also a tie in the North division, meaning that literally every team that finished above .500 can technically boast a conference championship that season.) The Aggies didn't even go to the conference title game, but still claim the conference title. 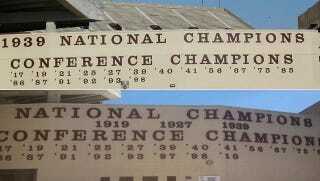 It's called the "mythical" national championship, but a better term for A&M's titles are technical. Sure, they had national championships, according to someone—but they're only valid if you're willing to accept all those other great national champions over the years, like the Centre College Praying Colonels in 1919, Tom Osborne's 9-3 Huskers in 1981, or Boise State in 2006. In other words: enjoy those fake titles, Aggies. Whatever helps you sleep at night.